Bell's Vireo at the Tip tram stop on 13 May 2011. It had a broken eyering with a faint white line over the bill, white chin, yellowish belly and one wingbar. 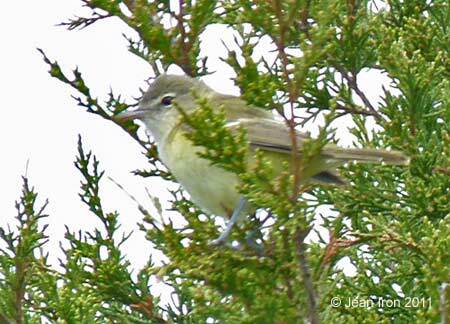 The dark area on the lores immediately in front of the eye is an important distinguishing mark of Bell's Vireo. 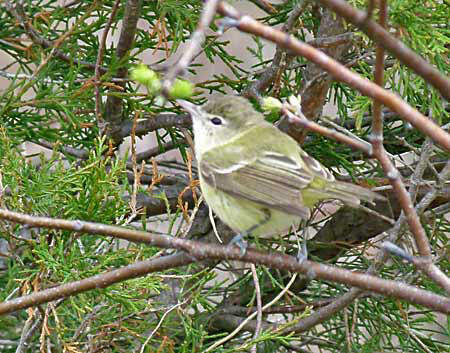 This vireo is very rare in Ontario. Bell's Vireo at Point Pelee on 13 May 2011.